Subliminal Release Date for Sprint's SGS2? Discussion in 'Android News' started by Malvado, Aug 24, 2011. Fast forward to today, where Samsung released an ad spot on their YouTube channel announcing the impending arrival of their Galaxy S II here in the states. 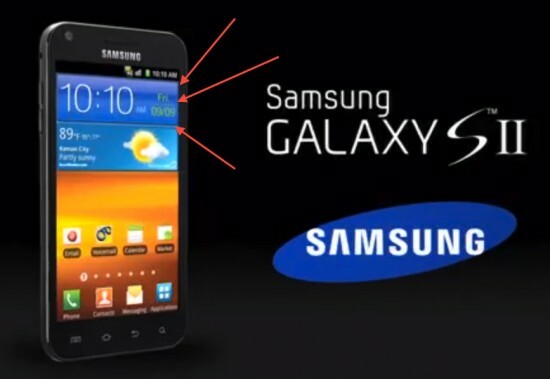 At the end of the video, they prominently display the U.S. version of the GS2 (complete with 4 capacitive buttons) but upon closer inspection — the date on the device’s clock widget is set to Friday, 09/09. Interesting… after seeing a similar stunt when HTC sent out press photos of the Sensation 4G displaying that device’s rumored launch date in their clock widget, this adds just a little more weight to that September 9th launch date we’ve been hearing. The location in the weather widget also just so happens to be the location of Sprint’s HQ in Kansas City. Nice one! The 10:10 is bigger October 10th it is. 10:10 - 09/09 = 01/01. I'm pretty sure we'll get this new year's day.